For a long time I kept seeing silos in Minnesota with the intials A.C.O. on them. The first one I thought maybe it was the owners initials, but after seeing a number of these on different farms, I was pretty sure it wasn’t the farmers initials. Turns out I was right. The initials are those of Adolph Casimir Ochs. Adolph Casimir Ochs located his brick plant in Springfield, Minnesota. However, some of his popular ACO silos were built hundreds of miles from the Springfield brick plant. This particular barn is near St. James, MN and features a regular size silo and something that looks like a mini silo right next to it. Here is a site with a lot of info on the silos and Minnesota brick companies in general. 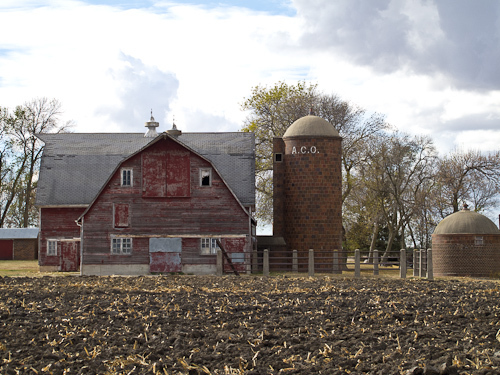 This entry was posted in Uncategorized and tagged ACO Silo, Adolph Casimir Ochs, barn, brick silo, copyright ryan ware, farm, farm site, field, silo. Bookmark the permalink.